"[Marjorie] is as imaginative as she is prolific." New York Times bestselling author Marjorie Liu (Astonishing X-Men, Black Widow) and artist Sana Takeda (X-23, Ms. Marvel) come together for the all-new ongoing fantastic adventure, MONSTRESS, first announced at Image Expo and set to launch from Image Comics this November. “Monstress is the story I’ve wanted to tell for years, a dark epic fantasy about a young girl who has suffered tremendous loss and who isn’t quite certain how to put herself back together—if that’s even possible. To make matters worse, she fears something else is living inside her: a monster. And she’s right to be afraid,” said Liu on why she was first inspired to write MONSTRESS. “My other motivation for telling this story is that powerful women are always imagined as monstrous. Bringing women, monsters, and power together—setting this in a world that never was, and could be—is something that speaks to my heart. Every single girl in the world has had to fight to have herself heard, to have space and a self in societies that try their best to deny them all three. Every single girl, whether we want to recognize it or not, is a warrior. And me writing about a young warrior woman is less a fantasy than a reflection of what it means to grow up a woman in societies like ours. MONSTRESS #1 (Diamond Code SEP150509) will launch at triple size, weighing in at 72 pages for only $4.99 and in stores on Wednesday, November 4th. The final order cutoff deadline is Monday, October 12th. Pre-order cards are available online for customers: http://monstress-comic.tumblr.com/preorder. Marjorie in an attorney and the author of over nineteen novels and two New York Times bestselling series: the Hunter Kiss urban fantasy novels about a woman covered in demonic tattoos; and the Dirk & Steele paranormal romances, following a group of psychic and non-human misfits: mermen, gargoyles, shape-shifters, and witches. Marjorie is also celebrated for her comic book writing and is a popular panelist at conventions and other domestic and international comic book and literary events. Marjorie co-wrote the bestselling Dark Wolverine series for Marvel, and authored NYX: No Way Home, X-23, Black Widow: The Name of the Rose, and Astonishing X-Men, which received national media attention for the gay wedding of X-Man Northstar and his boyfriend, and was also nominated for a GLAAD Media Award for its 'outstanding representation of the LGBT Community'. Additionally, she wrote the story for the Marvel animated film, Avengers Confidential: Black Widow and Punisher, produced by Marvel, Sony Pictures Entertainment (Japan) Inc. and Madhouse Inc. Marjorie also gained national attention with the paranormal romance video game, Tiger Eye: Curse of the Riddle Box, which was based on her novel, Tiger Eye. The game was featured on Jimmy Kimmel Live, was a top ten bestseller at Big Fish Games, and is now available at select major retailers. This fall, Marjorie will be authoring her first creator-owned ongoing with Image Comics: MONSTRESS, a highly anticipated epic steampunk fantasy about a teenage girl who has a psychic connection to a monster. 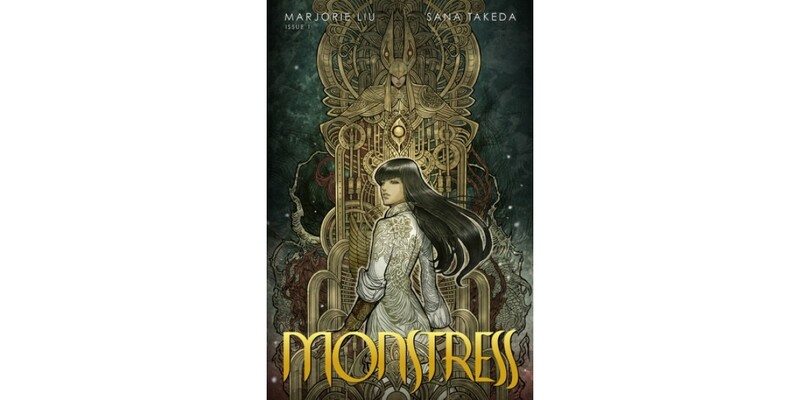 Set in an alternate 1900’s Asia, MONSTRESS pairs Marjorie with Sana Takeda, her former artist on X-23. Other upcoming work includes as-yet unnamed projects for Marvel and Dark Horse. Marjorie attended Lawrence University in Appleton, Wisconsin for her undergraduate studies, majoring in East Asian Languages and Cultures, with a minor in Biomedical Ethics. She then attended law school at the University of Wisconsin. For more than 16 years, Marjorie studied and traveled throughout Asia, working briefly at the US Embassy in Beijing, China. In 2004 she gave up practicing law to become a full-time writer, and divides her time between the American Midwest, Boston, and Beijing, China. She is a Lecturer at MIT, teaching comic book writing, and also leads a class on Popular Fiction at the Voices of Our Nation workshop.